Of all the OSS standards available you will probably come across TM Forum’s eTOM and TAM most often. The problem is no one can remember the difference between the two. And are they even worth the huge posters they’re printed on? Under the Frameworx brand (formerly known as NGOSS), the TM Forum maintains a number of industry standards for describing system functionality, processes and data exchange. eTOM and TAM are just two examples of TM Forum standards. Others TM Forum standards exist, such as SID, MTOSI, OSS/J and SMI. Some standards are specifications that can be implemented. 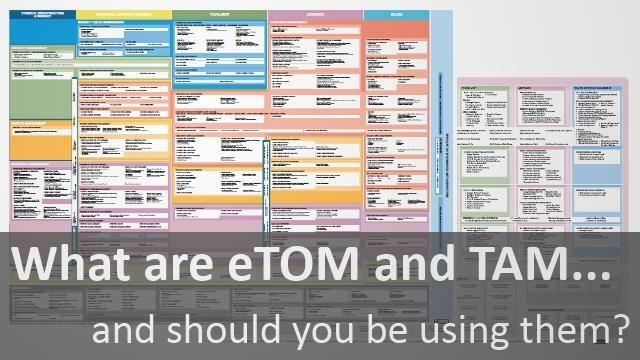 Others, like eTOM and TAM, are used to describe and position OSS/BSS systems and processes in relation to one another. Let’s clear something up right now: Neither eTOM nor TAM are interfaces, data or integration standards. They are not APIs. You cannot ‘write’ some code to implement them. TAM and eTOM allow vendors and customers to talk about OSS/BSS functionality and process with a common reference point and a common language. They allow vendors to articulate how a product fulfils a particular role in the telco’s OSS/BSS environment. In fact, TAM and eTOM are both ‘maps’. ‘Horizontal’ management functions, that must be considered by some or all of the vertical business functions, such as Customer Management and Resource Management. For example, Resource Management must be considered in all business functions: Resources are allocated during Fulfilment; Resource usage is tracked for Billing; Resources are planned and procured as part of the CSPs business Strategy…. While the terrain is the same, the directions provided by the two maps is subtly different. What is the Difference Between eTOM and TAM? TAM lists applications that support particular business processes and management tasks. Essentially it tells you that in order to do X you need a Y. For example, to do Resource Management in a Fulfilment process, one of the applications you will need is a Resource Design/Assign application. eTOM is a map of processes. In many ways it is similar to TAM but is somewhat more detailed, identifying tasks rather than just applications. For example, the Resource Management task that must be completed in a Fulfilment process is Resource Provisioning. This task itself comprises many sub-tasks such as Allocate & Install Resource, Configure & Activate Resource, Test resource, and many more. Guess what. The Resource Design/Assign application from TAM is an OSS system that runs Resource Allocation and Configuration tasks described by eTOM. They’re big and they’re clever. But what practical use are eTOM and TAM? 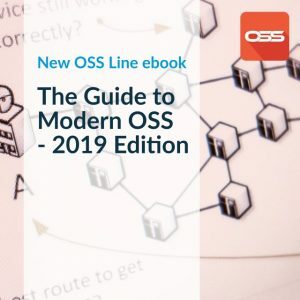 As I discuss in an upcoming chapter in the Guide to Modern OSS, they are both too detailed to serve as a simple, high-level way to describe an OSS/BSS environment. Where they excel is in any project that requires a complete or precise description of the OSS/BSS environment. When buying OSS/BSS applications. You will often find references to eTOM or TAM in CSPs’ RFI or RFQ (Request for Information/Quotation) procurement documents. Having an common reference means that both the CSP and supplier are talking the same language. If the CSPs asks ‘do you have a Resource Design/Assign application that can Allocate and Configure LSP tunnels on an IP network?’ there is little doubt what they mean. When designing and integrating systems. As I mentioned, neither eTOM nor TAM describe APIs or data formats for integration. But they do help by mapping out the processes and applications that need to interact to enable particular business processes. For example, TAM shows us that to carry out a Fulfilment process, we need to consider how an order flows from the Customer-facing systems, through Service Order Management and on to Resource Order Management. 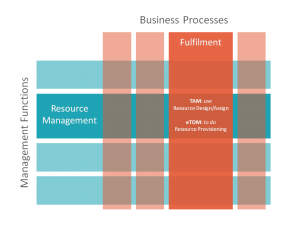 As a System Architect or Business Analyst, both eTOM and TAM are a useful reference to ensure you’ve considered all the points of interaction and the end-to-end flow of a process. eTOM and TAM are just different ways of looking at the same thing: What tasks does a CSP need to do? What applications does the CSP use to do those tasks?